You just tried virtual reality (VR) for the first time, and you love it except for one thing — something about the experience made you feel nauseated. It's hard to have fun when you feel disoriented and sick to your stomach. You don't want to miss out on all the VR fun, especially those VR puzzle games your friends told you about. You don't have to be left out of the VR party because you can't stomach it. Try out a few of these tips so you won't miss out on this amazing new technology. Fortunately, you can take steps to help you get your sea legs, or VR legs, as they're known. Check out these tips for getting rid of that sick-to-your-stomach feeling that some people experience during or after their first time in VR. You've probably heard the old saying, “You've got to crawl before you can walk,” right? Well, for some people, that's true for VR. In this case, if you're experiencing VR sickness, you need to sit before you can stand. When you first step into a fully immersive VR experience, your brain may become overwhelmed with everything going on. Add the complexity of balancing yourself while this new VR world is moving around you, and it may overload your senses and bring on that sick feeling. Look for VR experiences and games that offer a seated option, which reduces problems with the effects VR may have on your sense of balance. At this point in your VR development, if you have experienced nausea, you should stay aware from VR flight simulators and driving games. Even though they are seated experiences, they still may be too intense, especially if they simulate things like barrel roll maneuvers. Those can make people with iron stomachs feel sick. When you think you're ready to try a standing experience, start with something simple like Google’s Tiltbrush or a similar art program where you are in complete control of the environment, and the environment itself is relatively static. This gives you experience navigating and exploring a room-scale type environment while you have something to focus on (your painting). This approach gives your brain time to get used to this brave new world and not bring on any motion-induced VR sickness. 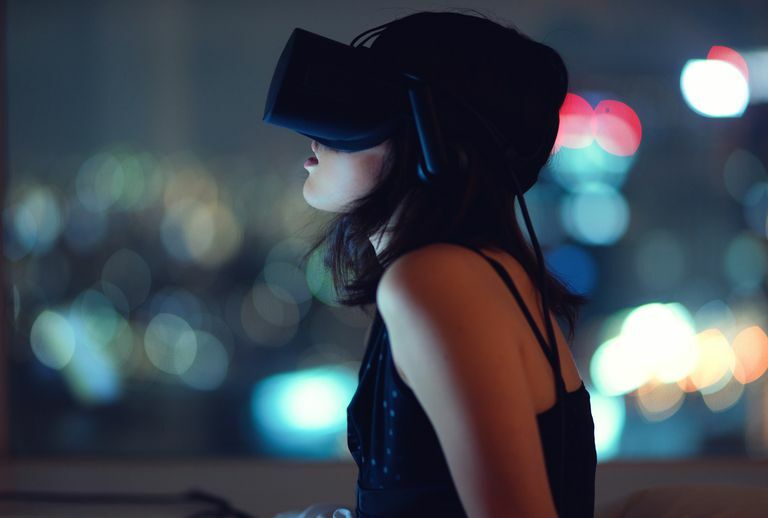 VR app and game developers are aware that some people are sensitive to VR-related side effects, and many developers add what has come to be known as comfort settings to their apps and games. These settings usually consist of various techniques to make the experience a more comfortable one. This can be achieved by changing things such as the user’s field-of-view, point-of-view, or by adding static user-interface elements that move with the user. These visual anchors help reduce motion sickness by giving the user something to focus on. Before you start a VR game or app, look for the settings labeled “comfort options” or something similar and see if enabling them helps improve your VR experience. While it may be tempting to buy a VR headset and use it with your existing PC, if that PC doesn't meet the minimum VR system requirements established by the maker of the VR headset, the experience could be ruined or could induce VR sickness because of system performance issues. Oculus, HTC, and others have established a benchmark minimum system specifications for VR that VR developers are told to target. The reason for these minimums is to ensure that your PC has enough power to achieve the proper frame rate needed to make for a comfortable and consistent experience. If you skimp on hardware and don't meet the minimum recommended configuration, you're going to be in for a subpar experience that is likely to induce VR sickness. One reason these specs are important is that, if your brain notices any lag between the motion your body is making relative to what your eyes are seeing, any delay produced by substandard hardware breaks the illusion of immersion and messes with your head, possibly making you feel sick. If you’re prone to VR sickness, you may want to go above and beyond the minimum VR specs to give yourself the best possible chance for a VR sickness-free experience. For example, if the minimum video card spec is a Nvidia GTX 970, maybe purchase a 1070 or 1080 if your budget allows. Maybe it helps, maybe it doesn't, but additional speed and power is never a bad thing when it comes to VR. If you've resolved all the technical issues and tried the other tips, and you're still having VR sickness issues, you may just need to spend more time and gain more exposure to VR. It may take you a while to get your VR legs. Be patient. Don't try to push through the discomfort; your body needs time to adjust. Don't rush things. Take frequent breaks, avoid VR experiences and games that don't sit right with you. Come back to those apps at a later time and try them again after you have more experience. It's important to note that not everyone who tries VR ends up getting sick or feeling nauseated. You may have no problem at all. You can't know how your brain and body will react until you try VR. In the end, VR should be an enjoyable experience that you look forward to and not something you dread. Don't let VR sickness turn you off to VR as a whole. Try different things, gain experience and exposure, and hopefully, with time, your VR sickness will become a distant memory.